Whether you're hoping for a classic and traditional ceremony or one that's a bit more offbeat, here's how to select wedding ceremony music that's right for your big moment. The wedding ceremony music that you choose is often your guests’ first impression of your big day. Will your nuptials be formal and traditional or more casual and modern? Picking the right songs for different portions of your ceremony will help create your wedding’s atmosphere and style. Before choosing specific songs, think about both the type of ceremony you are hosting as well as the venue where it will take place. If you are hosting a traditional ceremony in a house of worship, you may only be able to play certain religious wedding ceremony music. If your wedding is held in another location, you might have more flexibility. Also, think about who will be performing your wedding ceremony music. Are you having live musicians or a DJ? Your music pros can be very helpful when it comes to selecting the specific songs that will play during the ceremony. 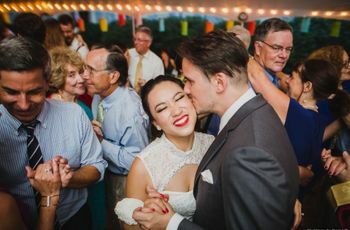 If you’re still having trouble selecting your ceremony songs, think about other weddings you’ve attended where you’ve liked the music and ask the couple about their song selection. You can also browse online wedding song lists to get ideas. 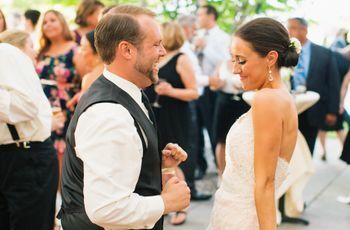 From the prelude to the recessional, these are the important moments where you’ll need to select wedding ceremony music. The prelude music will play while guests are entering and taking their seats. This music aims to welcome the guests to your wedding, and sets the tone for the rest of the ceremony, so be sure to choose wisely. 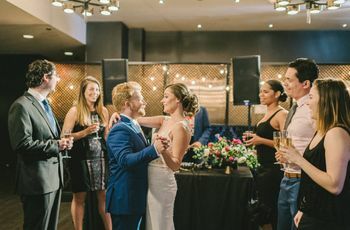 Whether you prefer classical or more modern music, we recommend choosing tunes that have a romantic and upbeat feel—and yes, you’ll need to choose multiple songs as the prelude will last about 20 to 30 minutes as guests are arriving. 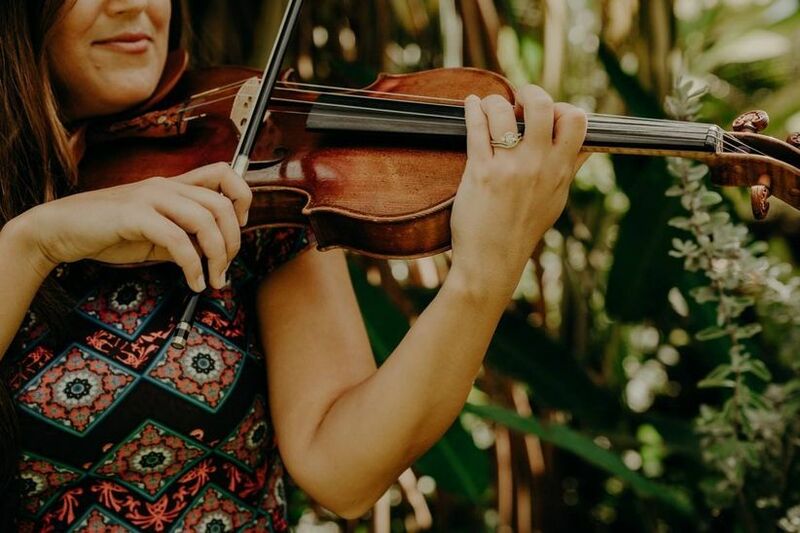 A few options to listen to “One Hand, One Heart” by Leonard Bernstein from West Side Story, “Air on a G String” by Bach, and “Somewhere Over the Rainbow” by Israel Kamakawiwo’Ole (this song is particularly nice for an outdoor beach wedding). The processional song is the wedding ceremony music that is played while the wedding party is walking down the aisle. Our rule of thumb here is to choose music that’s neither too fast nor too slow. Select a song that has a rhythm that matches a natural walking pace. A few of our favorites: “Canon in D” by Pachelbel, “A Thousand Years (Instrumental)” by The Piano Guys, and “Ribbon in the Sky” by Stevie Wonder. After the wedding party has taken their places, there is a brief pause before the bride’s entrance. Traditionally, all of the guests stand up and a new song—typically one with a bit more drama—is performed. You can go in a variety of directions with the bridal processional, from something grand and traditional to a song that’s sweet and lively, but just be sure that it matches the magnitude of the moment. A few popular bridal processional songs include: “Air” by Handel, “Here, There, Everywhere” by The Beatles, and “At Last” by Etta James. 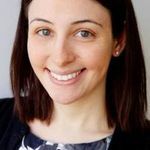 While you don’t have to have interlude music during your ceremony, it may be necessary play music during a particular ritual or to transition from one portion of the ceremony to another. Interludes can also be a nice addition if you have a friend or relative with musical talent who you would like to perform during the ceremony. Interlude songs are usually have an ultra-romantic and emotional feel. Some examples include: “Ave Maria” by Schubert and “In My Life” by The Beatles. You’re married, and it’s time to celebrate! The recessional song should be very upbeat and joyful to help lead guests into the celebration to follow. You can even be a little cheeky and humorous if you so desire. Some recessional songs you might enjoy include: “Love on Top” by Beyonce, “Ode to Joy” by Beethoven, and “I Do” by Colbie Caillat. 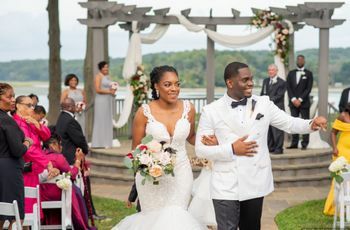 Guests may linger for a bit after the proceedings ends, so you’ll want to have some wedding ceremony music lined up to be played after the recessional. The postlude songs should have a similar celebratory feel to your recessional song. Examples include: “Beautiful Day” by U2, "Here Comes the Sun" by The Beatles, and “Happy" by Pharrell Williams.